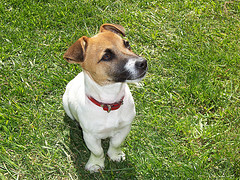 These Jack Russell Terrier pics come courtesy of deviantart.com. Thanks Ross for some great looking photos. This is Mac, part of my life or the best one, He was a stray dog puppy with 8 or 9 months old and his sister Clarice a puppy German Sheppard with 6 months old, when my ex girl friend found then, but for couple reasons we couldn't keep then with us that moment and we drop both at Shelter in Texas, but every single day we drive to there and look how he and Clarice is going, we try adopt both but the manager in my apartment refuse to accept Clarice because she was a German Sheppard over 30 pounds..We were very sad about this, until some Saturday in October in 2009 we finally adopt him and other person adopted Clarice, now he is 3 yrs..I love him and we are always together I pray every day and say thanks God for this gift he is wonderful and lovely..We love you Mac. Have you got any pics of your Jack Russell that you would like to see featured on this website? Send me at least 4 pictures and you could see your little jack in his own slide show. Yeah? Just upload your pics here. We're always anxious to see new dogs grace these pages with beauty and personality. We are at present seeking Jack Russell pics that feature human interaction or with other animals, especially unusual animals. We will be creating a full page just about puppies too. So if you've got an irresistible puppy, get the camera out and send them on to me, okay? I'll love being able to offer them to the world, as well as seeing them for my own pleasure. Most members of this breed are photogenic dogs, because these dogs are simply outstanding in looks. They are extremely muscular as well. When you would pick up my dog Jimbo, it was like picking up a canine Arnold Schwarzenegger! He was very stiff and hard all over and didn't bend very easily. And he was 9 years old! I've always said, if Jack Russells were the size of a German Shepherd, they'd be 'Terminators' of unbelievable strength. There's still more Jack Russell pics here among the Gallery pages as well as great photos, art, books, gifts and information spread all over this site. And I will be adding new great dog pics all the time. So come back often and see the newest Jack Russell Terrier Pics, okay? Okay! 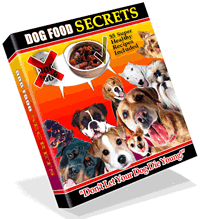 I can't recommend Dog Food Secrets enough to anyone who wants to know the shocking truth behind commercial dog foods.